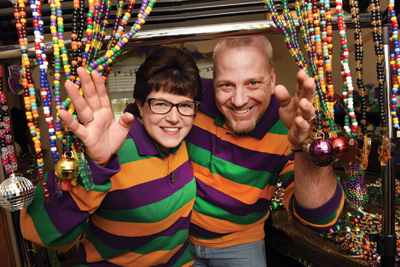 When Aron and Misti Medders rode during the Krewe of King Arthur Parade last year, they wanted to offer paradegoers a little lagniappe in addition to the usual batch of throws. So, the husband and wife team started stringing their own beads, which they threw during the parade. Persons lucky enough to catch these throws immediately wore their new treasures instead of dropping them in the bead bag. They were a hit. The Medders were hooked and, by the time the Irish-Italian Parade rolled around, their beading hobby had turned into a business: Bayou Throws. Bayou Throws currently offers a wide selection of hand-beaded throws made from recyclable, nontoxic materials. In addition, the company utilizes companies based in the United States (and often New Orleans) for all of its major components. What is more, the colors and designs for beads can be easily customized for individual events. Although Bayou Throws is still a new, growing company, it can crank out an astounding volume of beads. First, the company invested in materials in a big way. Following last year’s Irish-Italian Parade, they placed an order for 2.5 million pony beads, which arrived at their home in nine enormous barrels. And the Medders have turned these beads around in no time. After finding the right configuration of beading rack, beads and thread, a Bayou Throws worker can now produce six to eight dozen finished throws an hour. This scalability has helped the company grow in a hurry. For the 2017 Krewe of King Arthur Parade, for instance, Bayou Throws crafted approximately 600 dozen beads. Other krewes, floats and individual riders also placed orders for custom throws. In addition to making Mardi Gras beads right here in Louisiana, Bayou Throws also works closely with local charitable organizations. For instance, they have donated several dozen beads to the Arc of Greater New Orleans. The company is also a big supporter of the Autism Society of Greater New Orleans. In addition, Bayou Throws can supply beads for fundraising events at a discounted rate. As the company continues to grow, Aron hopes Bayou Throws will soon require a larger building, seasonal workers and of course many more orders of beads. Chances are, these unique beads will continue to make a splash at more and more parades each season. For more information, and to make a purchase, visit BayouThrows.com, email info@bayouthrows.com, call 459-9553 or visit Facebook.com/BayouThrows.